Patios are probably one of the most underutilized aspects in designing a beautiful home. Even though most houses, these days, do contain one in its overall design, patios are treated as more of an add-on, rather than a central living, breathing space of your overall living quarters. The same applies for the pool area whose design ends up being either ornamental or practical and not quite in harmony with the overall scheme of your home. This is where our construction services can come to your rescue! We are a group of master craftsmen specializing in a variety of construction services including building sunrooms, patio, pool screen enclosures, patio screen enclosures etc. With years of experience under our belt, Treasure Coast Pool Screen Enclosure Installation and Repairs is easily the most recognizable name in the industry. Our expertise lies in not just building high-quality installations that can easily withstand the pressures of time and weather elements, but also aesthetically designed features that lend their grace to the overall beauty of your home. While we are obsessed with creating picture-perfect patio covers, pergolas, outdoor enclosures, pet screens, screen enclosures, lattices and a variety of other offerings, our focus remains on delivering quality. We only network with the absolute best suppliers in the industry and our technicians feature some of the most experienced hands in the business. We only use the most durable grade aluminum and do our bit for Mother Nature by using eco-friendly materials to make your home safer and more energy-efficient. Needless to say, everything built by us meets the most stringent US and international building regulations and safety parameters. We combine a strong technical base in understanding project requirements, building geography and usage criteria and try to meet these needs with the absolute best material and design built by us. Of course, we also ensure that all of these meet and over-deliver on what you expect from the project, your budget and particular needs. We also undertake custom construction requests as per your requirement. If you have a pet idea that you have been fiddling around with for a long time, all you need to really do is give us a call and relate it to us. We can help guide you fill in the gaps of your beautiful imagination and even better, translate it into reality with our construction skills. We love a creative challenge, so the more ambitious your experiments are, the happier we will be to serve you in building it! Do not fret about space or budget constraints. Rather just focus on visualizing your dream project in as much detail as possible. What other people may find weird can be come uniquely beautiful when it is a labor of love and personal vision. And we will always be around to make your construction dreams a reality. Give us a call today to get free consultation, advice and even an estimate for your cherished building or redesigning project. Enough with the new. What about the old? So you aren’t in the market for anything new, but you are looking to do up some of the old fixtures in your place. We undertake all kinds of repair and re-construction projects. Whether it’s the combined effect of time and weather elements on your house or a sunroof damaged by a freak storm, or simply an ugly pool enclosure you need updated, we can take care of it for you. The only thing we insist on is that you keep in mind patio, sunrooms, and pool enclosures are not meant only for ornamental purposes. Aside from serving practical purposes, these areas of your house can be creatively infused with life in such a way that they literally become the centerpiece of attraction not only for people surveying the house – but those living in it! Since these areas are also the ones that afford you with the most natural sunlight and air, you could literally design them in a way so your daily routines devolve around them. And of course, the more unique the end-results are, the better value they will add to the property should you ever decide to rent or sell it. But, in general, we have found that an investment into beautifying your living space pays dividends in ways you can’t even anticipate until you start living in it! You already know we offer the best patio screen enclosures, roll-up screens, sunrooms, and fences. We can also help weatherproof your home and repair sections if needed. But not all homes are made equal and not all problems are the same. Maybe you are having a problem with insects or want to protect your home from harmful UV rays. If you have a unique construction or building challenge, give us a call today to set up a free consultation. You don’t have to pay an arm and a leg just because you want a new look to your home. So what if you can’t add a new room due to budgetary constraints? Make use of what’s available to you already. And here, we will let you in on a little secret. The niftiest trick to make a small place look bigger? Make use of the open space around and design it in a way that it looks like a cohesive whole with the house itself. Added bonus, who doesn’t love the outdoors? We know we do! A beautifully and intelligently-designed patio won’t set you back by quite as much as actually adding a new element to your house. On the plus side, you will get all the benefits of enjoying the outdoors, right from the comfort of your own home. Just build in a new screen enclosure, a pretty little porch or sunroom and see open and airy your house feels all of a sudden. But these are more than just pretty features. Sunrooms especially can come in really handy when you want to enjoy the Sun but are loath or unable to get outdoors. We have also seen sunrooms doubling as greenhouses, which make for a very pleasing design aesthetic while making your home greener and healthier. They can also be very practical for the elderly and invalids and shield them from cold or rains even while allowing them a glimpse of the outdoors. There is nothing quite as charming and old-world as seeing an elderly relative reclining on a sunlit porch and recounting stories to the little ones! If you are looking for inspiration or ideas, you are welcome to go through the website for ideas, or pick up the phone for a direct chat with us to know what’s on offer. If you still are in two minds about the cost-to-benefit ratio of the project, we suggest you chalk out the long-term benefits of implementing a permanent addition to your household that can both enhance the value and beauty of the property as well as be incredibly useful in day-to-day lives and compare it with any other competing short-term expense such as buying electronics or getting a short vacation. The thrill of the new phone will wear off in a few weeks and the vacation will exist as memories and social media posts, but years down the line, your porch or sunroom will still be waiting for you on a cold afternoon, swathed in sunshine all over! A home is a place where most of us spend a majority of our lives in. Any investment made in the direction of improving your living space can only provide you with returns that are thousand-fold since you enjoy the benefits daily. But if you have made up your mind, contact Treasure Coast Pool Screen Enclosure Installation and Repairs today to create the best enclosures, railings, sunrooms or porches for your home. There are times when you want to enjoy your swimming pool but the outside weather is not allowing you to. This could be due to a heavy down pour or very cold winter days. 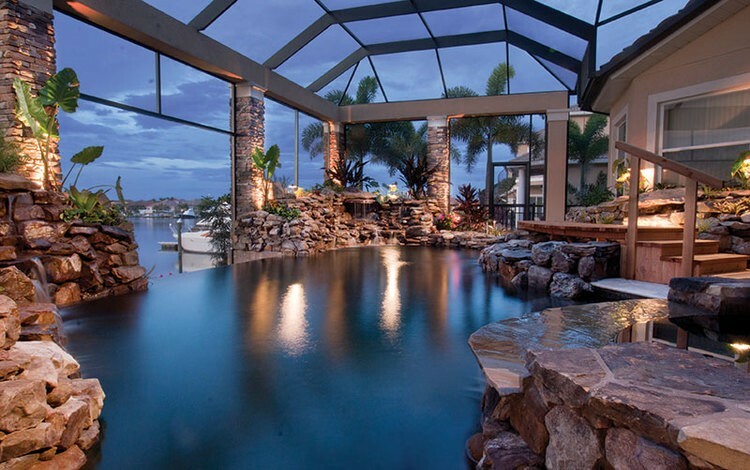 A pool screen enclosure will allow you to enjoy your outdoor space in an enclosed environment. The most important thing is to get a reputable brand like Treasure Coast Pool Screen Enclosure Installation and Repairs to handle the installation process. This will also help you in significantly reducing the maintenance fee as the pool will always be clean. The reason is that the pool screen enclosure will prevent debris from finding their way into the pool.